Somewhere over the Brecklands of Norfolk and its monochromatic pines, the rain hit us. Flying through a shower, even when it is torrential, is not like flying into a weather front. Though the rain, streaming multiple wide rivulets along the canopy, restricts your visibility straight ahead, there is light beyond and you can, if sometimes obliquely, see many miles ahead. I radioed our destination to check that this wasn't wishful thinking and almost as soon as we had signed off, the rain did the same and I could see ships and wind farms way out into the North Sea bathed in sunshine. 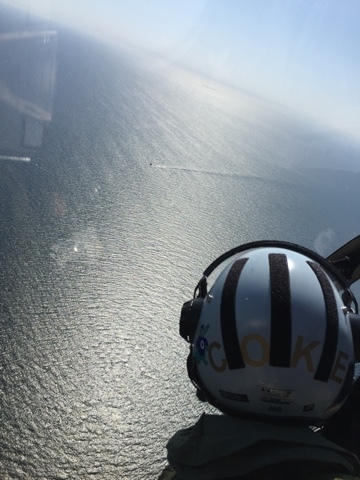 Flying over the sea is always a pleasure for me. 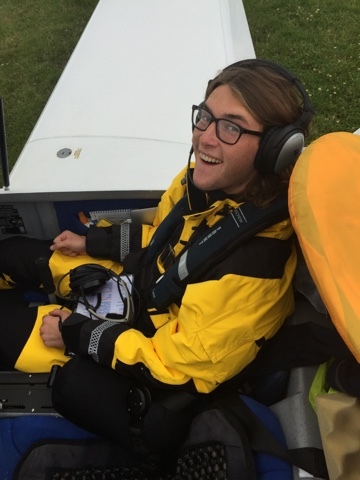 I know that the engine doesn't know that it is over water - and even if does decide to go quiet, I have a life jacket, drysuit, flares, radio beacon, liferaft and a parachute that is attached to the plane which will deliver me towards Davy Jones's Locker in a vertical, rather than horizontal, direction. I love the stillness and lack of turbulence, the horizon that merges into the glare and the sense of being suspended in a void with only the radio chatter to connect you to the real world - and not even that when someone else is with you and listening out for the radio while you, as the song goes, get lost in music. 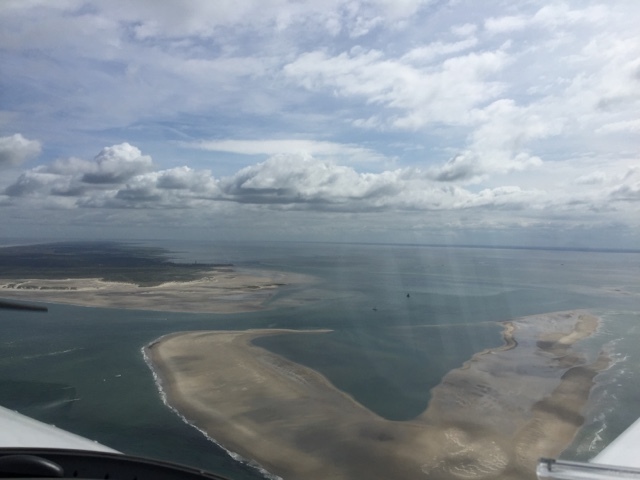 Our first destination was Texel, the first of the Frisian islands that run as a coastal barrier from just north and east of Amsterdam all the way along the Dutch and German coasts to the Elbe estuary and the Danish peninsula. They are flat and sandy and protect an inner lagoon of sandbanks and shallows that formed the backdrop for Irskine Childers's Riddle of the Sands, the pre WWI espionage thriller, that captured the imagination of not just schoolboys in those paranoid days. If you have been to North Norfolk the landscape will be familiar - dunes and reclaimed farmland - but with Dutch style houses rather than the Norfolk variety of faux Georgian and Farrow and Ball. As we taxied in we were greeted by the sight of a Piper Cub landing on the back of a fast-moving trailer. It was airshow time. When we asked how we got into town we were told to help ourselves to a bike from behind the Tower. So far so Dutch. The Frisians, from what Louis and I could see, are holiday destinations of the East Coast of England variety - not that high end, with much beer and more chips, spectacular beaches and dunes and a sea that does not beckon with an enticing blue. From the air they are beautiful, stretching in a long arc eastwards and enclosing a huge shallow lagoon populated by traditional Dutch sailing barges. Our first destination the following day was Langoog - which is as strange as its name suggests. It's German and from the stream of traffic that got in the way of my final approach, it would seem that flying is popular in Germany. We walked into the town and as we progressed we realised that there was no normal noise of the internal combustion variety. Everything was pedestrian or electric. Sounds good? Actually it's weird. Louis got it; it's Wittering meets the Truman Show. When we nearly hit a robot mower doing its bit on the taxiway, that impression didn't go away. 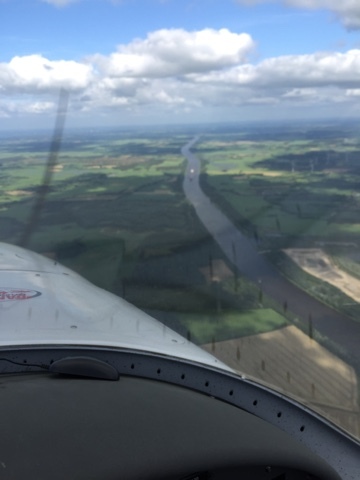 We tracked across northern Germany along the Kiel Canal which connects Baltic and the North Sea and which, back in Kaiser Bill's time, allowed the German Fleet to leave their private lake to the east without having to be hostage to the Swedes and Danes that control the choke point between the two seas. 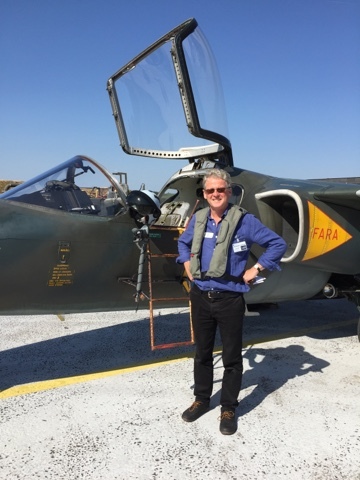 The point of this trip to Copenhagen was to get the 'gallant little plane', as my father used to call it, to the Baltic for our summer expedition in late August - firstly with the Air Squadron to visit a Swedish front line fighter squadron and secondly to explore the Baltic where I have never been before. North Sea weather is notorious so it was a case of Carpe Diem while the sun was shining. And the wisdom was proved as Amanda, Joe, Jess and I spent a sunny day two weeks later bicycling around Copenhagen while my Air Squadron friends - who have much more grown-up hardware than me and many more skills in the aviation department - battled across the North Sea in low cloud and rain. A fat high pressure system (good) was sitting over the Baltic at the same time as the traditional series of August lows (bad) greeted the advent of the grouse shooting season at home. Result. 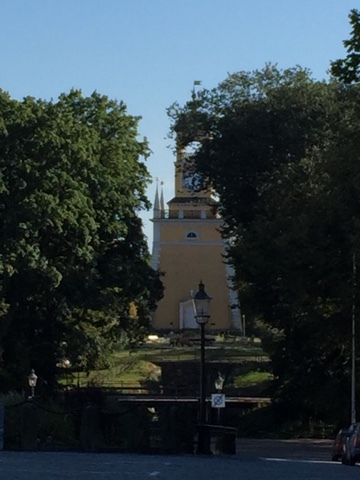 Karlskrona, Charles's Crown, is on the sea almost on the south tip of Sweden. It was founded by Charles X in 1680 as the home of the Swedish fleet that had until then been based much further north in Stockholm. 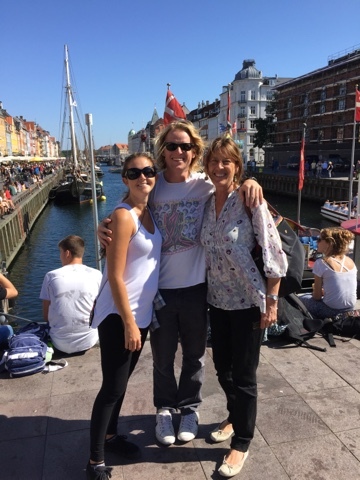 The Baltic is brackish - and warm in summer as we found out on our early morning swim: the North Sea is about 12 degrees in summer compared to about 18 degrees where we were and you could drink Baltic water: it's cheaper than Badoit and taste the same. 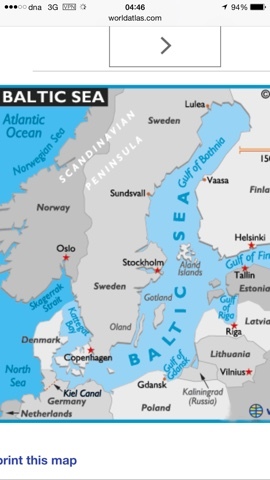 If you look at a map of the Baltic you will see that it's entrance is narrow near Copenhagen which is on the same latitude as Newcastle. The far north is just short of the Arctic Circle and fed by countless rivers from principally Finland and Sweden. 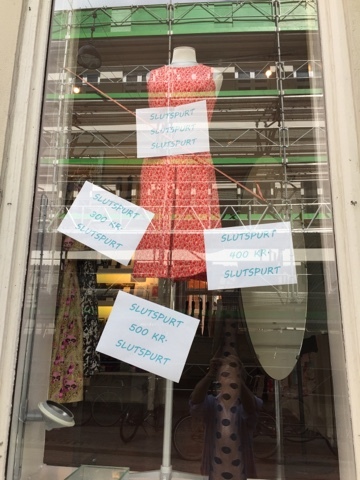 Stockholm is the same latitude as the Shetland Islands and in the seventeenth century, during a period when even the Thames froze, the Swedish fleet was iced in for the winter - which was something of a disadvantage when you are the then local top dog and are having problems with the Danes. 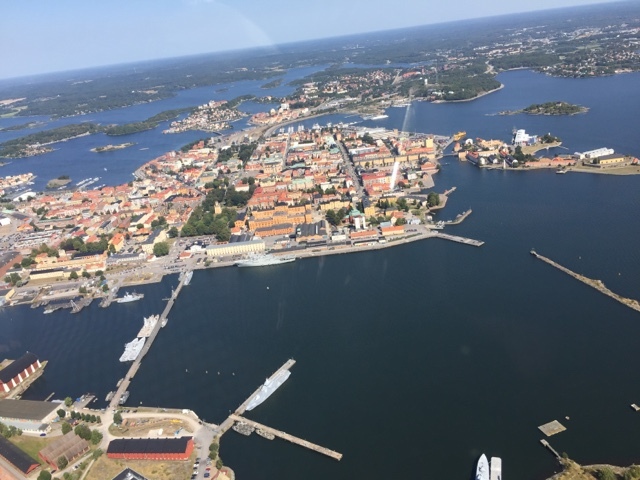 Karlskrona is set in an enchanting archipelago of islands and built with the style and beauty of the 17th and 18th centuries in a grid pattern on one of the islands. This was where we were staying. Ronneby airfield is nearby and the home of the Blikinge fighter wing. 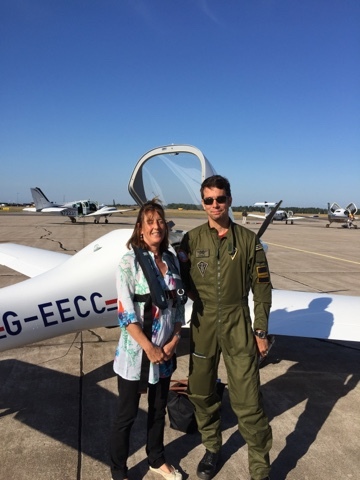 Many of the Air Squadron members have a military flying background and one is a current RAF Air Marshal. It was under his aegises that we had been invited. It was a fascinating time to be there as this is now on the front line of the new 'Cool War' in Eastern Europe and the two squadrons based there are on 24 hour alert to deal with almost daily incursions by Russian aircraft operating out of the Gulf of Finland and Kaliningrad, the old Koenigsberg - the capital of East Prussia, and now a strange Russian enclave that is cut off from Russia and sandwiched between Lithuania and Poland. 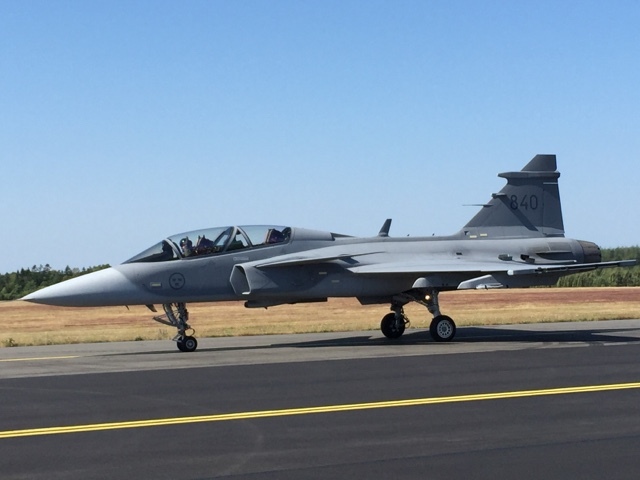 Sweden is not part of NATO and takes its air defences very seriously with over a hundred fighters equipped with Saab built Grippons. The RAF have a similar number of Typhoons. During the Cold War they had over a thousand aircraft - for a country of only nine million people. Ronneby is a station like many in the UK - but it wasn't always like this. During the Cold War it would have been too vulnerable and they dispersed their aircraft around the countryside, operating off public roads with their own maintenance crews and refuelling in the event of war - a logistical and manpower mountain only possible in an era of conscription. With the end of the Cold War they reverted to a more 'normal' airforce base from which they are deployed, like the RAF, to the world's trouble spots. With Putin's sabre rattling they have gone back some of the way to being a front line force on high alert with near instant dispersal plans. It was very impressive. 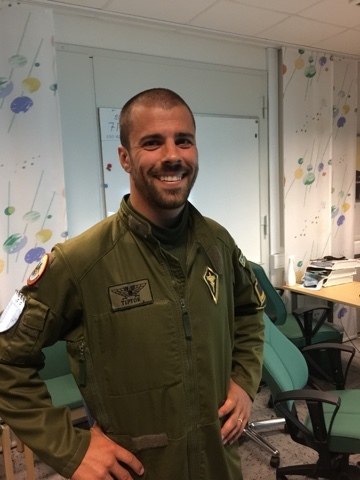 Our host was the head of the Swedish Airforce - and he really looked the part in one of the smartest uniforms I've ever seen and exuding authority and command. Think of the captain in Das Boat and you will get the idea. The base was super modern and the pilots made Top Gun look like a film for ugly people. I have ordered up a couple for Amanda's Christmas present. The Grippon is a single-engine multi-purpose fighter. It is an economical aircraft that costs about a third of a Typhoon and, with the single engine, much lower running costs. It does air-to-air, ground attack and reconnaissance and we saw all these weapons and equipment in hangers that were pin-clean and organised by ground crews and pilots that looked indistinguishable from their civilian counterparts: many had beards and some had not exactly long hair but definitely not the British military look. There was an easy informality between ranks that was combined with professionalism and efficiency at every level. I sat next to the Wing Commander at dinner and he was saying how easy his leadership role had become over the last few years: everyone knows exactly why they are there and the job that needs doing. Putin is making that side of his job a breeze. The Grippon is an easy aircraft to fly. I know this as I had a go in the simulator and pulled a subsonic loop and shot down a Russian who conveniently didn't move that much and wasn't shooting at me. As the pilots showed us 90% of what they do is managing the weapons - and doing this while pulling up to 9g. Because of the G forces all the controls are on the throttle and stick - you can't raise your arms when pulling G: there are 14 and 12 buttons and switches on each respectively. It is like playing the piano with a pony sitting on your lap and your eyeballs feeling as if they want to disappear down your throat - while someone is trying to kill you. The simulator is one thing - but watching a display afterwards where a Grippon was being hurled around the sky was quite another. A long-retired Air Marshal who is one of our party was telling me about flying Lightnings as a young man. From brakes off to 36,000 ft took 90 seconds. Think about that. Being Sweden, they are operating in what can be, to say the least, hostile conditions. Unlike their more southerly counterparts, they fly happily off snow which they roll and scarify rather than attempt to clear. The Grippon can get in and out of 600 metres and depends on brakes, not reverse thrust. Again, think about that. The piece de resistance was a ride in the back of jet trainer. 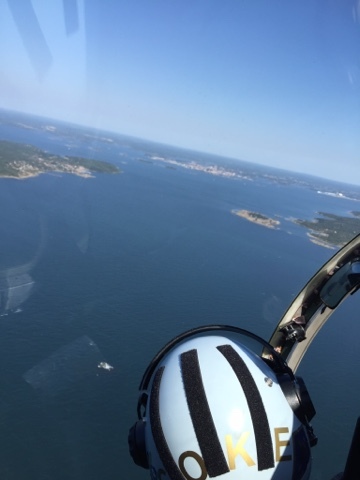 Even though it was an old machine, the spooling up of twin jets and the surge to 400 knots was unforgettable - as were the views over the archipelago of islands in the sunshine. 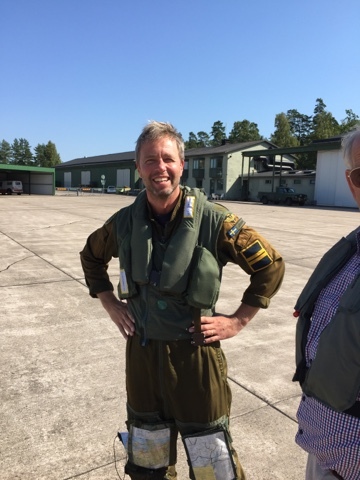 It was a great privilege to be allowed to see all this and as our European front line defences are in the hands of the Swedish Air Force - we are fortunate indeed. 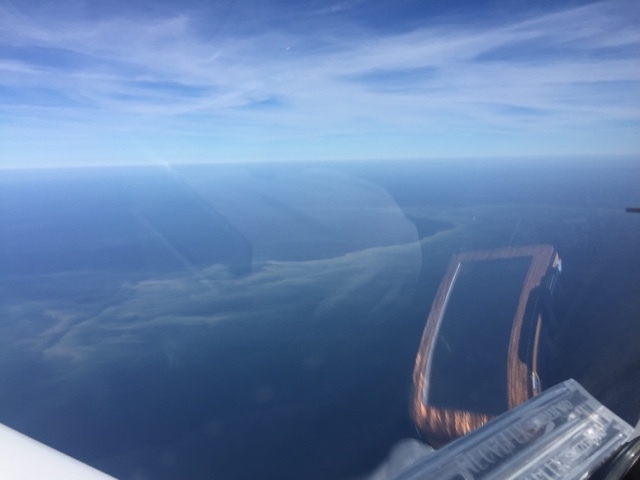 Yesterday we flew to Estonia across the width of the Baltic where we saw huge blooms of algae that looked from six thousand feet like sandbanks. We landed at a military base near Tallin from which four British typhoons are operating. There were many tanks parked around the base that are part of the NATO's post-Ukraine build up in the region. 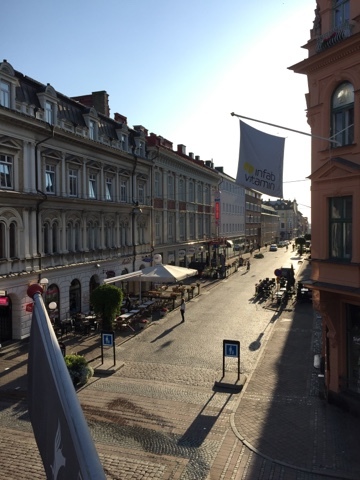 The tension is palpable; not so much in the tourist-drowned Tallin Old Town, but amongst the Estonian military and among ordinary Estonians when we headed out on bicycles to the more Soviet era beaches along the coast. In a restaurant our nice Russian-speaking waitress told us that she would like a union with Russia while, at the same time an Estonian woman - who hailed from Loughborough - told us that her grandfather had been taken away by the Russians and her great uncle by the Germans - and she had no wish to see any return to that. It's not Donesk yet - but the portents are not good. Tomorrow we head north to Finland: ultimate destination, Lapland and the Arctic Circle.